Your Maternal Lineage Ancestry DNA Test results will include a personalised map detailing the origin of your maternal ancestors, your maternal haplogroup and details about which celebrities share the same maternal haplogroup as you. Our Maternal Lineage Ancestry DNA Test is a laboratory based test which provides the most in-depth and far-reaching insights and information into the origins and migration paths of your ancient maternal ancestors. Without a DNA test, these important aspects of your ancestry would remain hidden and undiscoverable. Celebrities such as Eva Langoria, Meryl Streep and Queen Noor of Jordan have all sought to discover their maternal roots and ancestry through DNA Ancestry Testing. We all inherit our mitochondrial DNA from our mothers but it is only females that can pass it on to their children. All biological relatives in a family who have a common maternal ancestor will also have genetic sequences in their mitochondrial DNA profile which they all share. These shared genetic sequences mean that we can look at these individuals as belonging to the same mtDNA family. But genetic sequences in mtDNA will vary between different families. 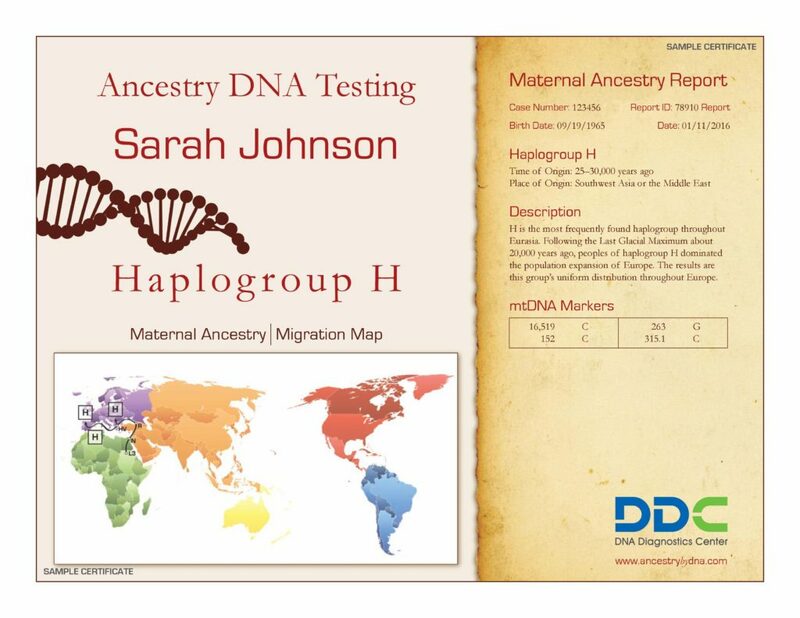 These differences are extremely important because they act as distinct markers of your maternal ancestry, enabling us to match your and your family’s mtDNA with that of your haplogroup or ancient maternal clan. Every person in the world today can be assigned to their own family haplogroup through DNA testing thanks to these genetic sequences that are inherited from our ancestors, giving them unique insights into their own direct maternal heritage. First of all, this test is aimed at discovering your ancient ancestral origins – which means it will trace your ancestry back thousands of years, pre-dating the world, its countries and all its civilizations and cultures as we know them today. People who share the same DNA in this sense are not exactly related. You can certainly share the same ancestry but not be relatives in any way. Haplogroups are groups of individuals sharing DNA variations that descend from a common ancestor. They are marked from A-Z for convenience purposes. 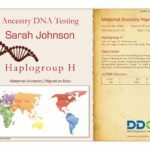 Your test results will confirm your very own haplogroup. For example, your results might show that you belong to Haplogroup T, which refers to the Tara people who came from the Near East and lived in Northern Italy around 17,000 years ago. Or perhaps they might show you belong to haplogroup V, in which case, your maternal ancestors are believed to have originated around the Western Mediterranean region, approximately 13,600 years before the present time, possibly in Iberia. Are you keen to learn more about the paternal side of your family? Your maternal ancestry is only half your family history. Why not discover the other half with our Paternal Lineage Ancestry DNA Test? The cost of our Maternal Lineage Ancestry DNA Test is £159. For a limited time, if you order our Maternal Lineage Ancestry DNA Test and Paternal Lineage Ancestry DNA Test (RRP £139) at the same time you pay a total of just £199 for both. Please note that due to the nature of the Paternal Lineage Ancestry DNA Test this offer is only available to male participants.